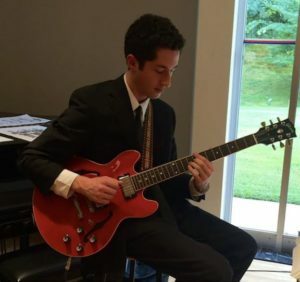 The Montclair Music Studio is proud to introduce Guitar Instructor, Evan Maltz. Evan received his Bachelor’s Degree from American University and has also studied jazz guitar at William Paterson University. Evan has been an MMS Faculty Member since 2016 and is the son of long-time Montclair Music guitar instructor Larry Maltz. The first music I ever remember hearing was The Beatles album Abbey Road. I also remember two respective greatest hits albums that had been given to me, one Ray Charles and the other Jimi Hendrix. However, my parents gave me a violin for Christmas when I was four years old, and throughout my childhood, I played mostly classical music. From ages four to fourteen, I studied classical repertoire on the violin. I performed in the school orchestra throughout the elementary, middle, and high school. One of my favorite memories from middle school is performing Dvorak’s American Quartet with a couple talented classmates at a competition outside of school. My first time picking up a guitar was when I was in third grade. When I was fourteen, I stopped taking violin lessons and began focusing on guitar instead. My father is a professional guitarist. Through the influence of my father, I began to listen to rock, blues, and jazz music. Music was always around the house, in the car, etc. I encountered an extensive amount of music as a result of my father’s knowledge. In high school, I was a guitarist in a funk band. In addition to original music, we covered songs by people like James Brown and Earth Wind and Fire, among others. One highlight was when we won Battle of the Bands our junior year. I also performed with the high school jazz big band. In my college experience, I have performed with both small ensembles and big bands. Occasionally, I mess around with a lap-steel guitar or a bass guitar. I also have some minor experience playing piano. At this point, however, I would say my main proficiency lies in guitar. When I lived in Washington, DC, I worked with small ensembles (mostly duos with bass players from my college) at corporate events in hotels. One of my more interesting gigs was performing solo guitar for an art exhibit at the Czech Embassy. Afterward, I returned to DC a year later to perform at a dinner event for the Czech Foreign Minister. I have many interests outside of music. I go running often, I enjoy reading, hiking, and the outdoors. Prior to my employment at the Montclair Music Studio, I worked as a National Park Ranger at Shenandoah National Park in Virginia and Frederick Douglass National Historic Site in Washington, DC. In those jobs, I studied history and nature, both of which remain of interest to me.